Enda Kenny is due to travel to London tomorrow for meetings with the UK prime minister. TAOISEACH ENDA KENNY has been urged to press UK prime minister David Cameron to take action on the legacy of the conflict in Northern Ireland, when the leaders meet in London tomorrow. 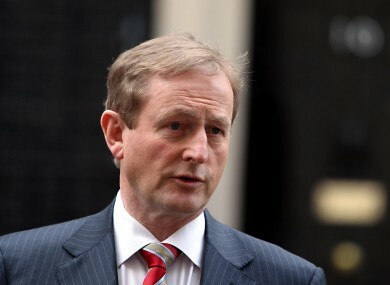 The Taoiseach will travel to 10 Downing Street tomorrow for a meeting which Kenny has said will focus on trade links. However, Sinn Féin president Gerry Adams has said the meeting is an opportunity to press for action on disputed issues arising from the Troubles. Adams cited calls for inquiries into several incidents including the murder of solicitor Pat Finucane, the Dublin and Monaghan bombings, and the 1971 Ballymurphy Massacre, in which 11 people were killed by British security forces in Belfast. He claimed Cameron had stepped away from the peace process since coming into power. “Since the election of the Tory/Lib Dem coalition the British prime minister has detached himself from the continuing promotion and development of the peace and political processes,” Adams said. The Taoiseach also needs to impress on the British Prime Minister the need to bring forward a timetable for the implementation of all of the outstanding aspects of the Good Friday, Weston Park and St. Andrews Agreements. Adams said other issues included the need for a Bill of Rights and an Irish Language Act in the North. Email “Taoiseach urged to press Cameron on Troubles legacy”. Feedback on “Taoiseach urged to press Cameron on Troubles legacy”.